Have you ever thought about starting a newborn and baby photography business, but are just not sure what it takes or how to attract the right clients? Do you already cater to new moms with baby and newborn portraits, but are finding it hard to grow your business or even maintain the level of sales you would like? If so, you’ll love this chat with Mimika Cooney, who sat down with me to talk about her own experience of running a baby photography business and how you can make a success out of it too. Mimika Cooney is an international award winning photographer, published author, speaker and small business marketing expert. She enjoys sharing her business marketing and photography knowledge, both online and at workshops, to other professional photographers and small business owners. She owns a residential portrait studio specializing in beauty, glamour and baby portraiture based in Charlotte, North Carolina. Born in South Africa, Mimika received her photographic training in England and is accredited licentiate by the British Institute of Professional photographers (BIPP) and the Society of Wedding and Portrait Photographers (SWPP). 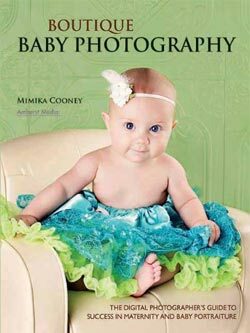 Mimika published her first book “Boutique Baby Photography: The Digital Photographer’s Guide to Success in Maternity and Baby Portraiture“, which is now available on Amazon and bookstores worldwide. 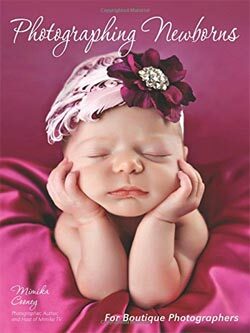 Her second book “Newborn Photography for Boutique Photographers” is due out September 2014. Mimika’s work has appeared on television on an American PBS TV documentary “Newborn Birth Injuries: the Untold Story”. Mimika has worked as a live on-air television broadcaster hosting a morning breakfast magazine show “York Today” in York, England, and has experience in the modeling and TV industry. She received television presenting training in South Africa from Nadia Bilchick (current CNN news anchor). Her training in public speaking, make-up application, TV broadcasting and model posing has proven useful in her photography and speaking projects. She travels the world to speak at professional photography conventions training other professional photographers and small business owners in both the USA and UK. She has spoken three times at the prestigious SWPP photographic convention in London, England. Mimika has worked and owned four businesses in three countries along with her husband in South Africa, England and the USA. With experience in website design, public relations and business administration in South Africa and England; she has been a specialist portrait artist and photographer for 15 years. Mimika has been mentored and undergone training by the photography and business industries most renowned authorities like Sarah Petty, Michael Port and David P. Macdonald. She now focuses on teaching, speaking and writing to share her knowledge with the world, and you can also find her new educational platform at Capture School.